Deceptively simple, the Adjustable Platform Feeder from Perky-Pet is a versatile option for feeding birds. With an integrated baffle to help deter squirrels and a metal feeding tray suitable for a wide variety of foods, this feeder is easy to use and can quickly become a backyard favorite. Baffle serves double duty not only to deter squirrels but also to protect the feeding tray from rain and snow. Baffle height is easily changed to restrict large birds' access to the feeding tray, helping keep bully birds away. Lightweight design and materials plus the built in hanging rod and hook allows the feeder to be set up quickly and easily. 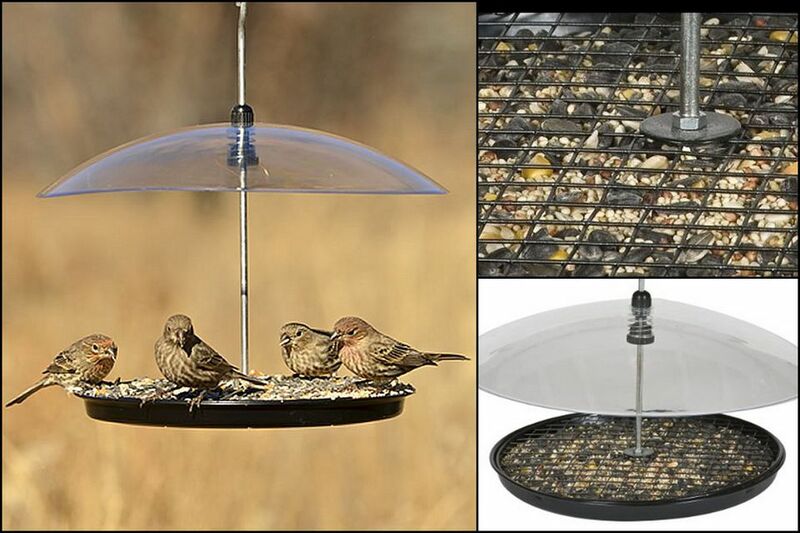 Design materials are surprisingly good quality for the feeder's inexpensive price. Baffle is exceptionally wobbly and while this is ideal for deterring squirrels, birds may be spooked by the excessive motion or noise as the baffle moves. Metal grate over the feeding tray is only minimally useful to deter squirrels and instead can inadvertently keep small birds from accessing seed when the food level drops. It is easy to remove the grate, however, without damaging the feeder or reducing its usability. Design lacks a locking nut below the feeding tray, but the hanging rod does screw in firmly and it unlikely to come loose. Adding a wing nut would alleviate the risk. Platform feeders may be easy to add to a feeding station, but they are also easy for bully birds, squirrels, racoons and other unwanted wildlife to take advantage of. The Adjustable Platform Feeder from Perky-Pet, however, has a built-in, spring-balanced baffle to easily tip away any non-birds that might try to raid the feeder. The clear plastic dome is resting on a sensitive spring and will tip at nearly a 45-degree angle if anything lands on top of it. Unfortunately, the spring is so sensitive that the dome may also wobble in even a light breeze, and wary birds may be frightened away. If the feeder is positioned away from windy areas, however, this can be minimized, and in time, birds can become used to the feeder's motion. In addition to serving as a baffle, the plastic dome also functions as a weather guard. This helps keep the feeding tray dry, and is most effective if the dome is positioned lower and closer to the tray. Adjustments are easy to make by twisting the plastic locking mechanism at the top of the dome and gently moving the dome into the desired position. When the dome is at its highest, larger birds can still access the feeder and squirrels may jump into the feeder from the side or ground. At lower positions, the dome offers better protection, but fewer birds will make use of the feeder. The adjusting mechanism has a firm hold, but may gradually loosen over time or if subjected to extreme conditions. The dome is clear, and while it can be scratched by talons, it still provides good views of feeding birds. The feeding tray is .75 inches (2.0 cm) deep and is ringed with 10 small holes for drainage and air circulation to keep seed dry. The holes are small enough that they could become blocked with debris, but their small size also makes the feeder more versatile because it can hold even smaller seeds, such as Nyjer or millet. Mixed birdseed blends, sunflower seeds and nut hearts will easily fit in the feeder. The feeding tray is covered with a coated metal grate. The sturdy grate is intended to further help deter squirrels, but the mesh is large enough that many industrious squirrels could still work seeds out of it. Unfortunately, the mesh does deter small birds whose bills cannot reach to the bottom of the feeding tray when seed levels are low. An easy solution is to simply remove the grate and use the feeder as an open platform, which further increases its feeding versatility. Without the grate, foods such as fruit, mealworms, whole peanuts and suet nuggets or crumbles can all be offered. Some minimal assembly is required before the feeder can be used, and it is necessary to partially disassemble the feeder for thorough cleaning if the grate is being used. An assembly instruction sheet with a diagram of the feeder's parts is included, however, and it only takes a minute or two to fully assemble the entire setup. Because the hanging rod is complete with a 1-inch (2.5 cm) hook, no additional gear is needed to hang the feeder from a branch or pole, though an extra chain or rope can be useful if desired. Platform feeders are a mainstay of backyard birding, and Perky-Pet's Adjustable Platform Feeder helps solve some of the biggest problems with these simple feeders by including a baffle and allowing for minor adjustments to exclude unwanted guests. While the excessive wobbliness of the baffle may scare some birds and the grate over the feeding tray can be an unintended barrier to small species, for its inexpensive price, this feeder is surprisingly versatile and of decent quality for several seasons of good, active use. Disclosure: A review sample was provided by the manufacturer. For more information, please see our Ethics Policy.